Working in the high school setting, I have the unique opportunity to train athletes of all different ages and ability levels across many different sports. However, no matter the sport or skill level, when they begin training with me and my staff in the spring of their 8th grade year they are all trained in the same manner. During my first year at Trinity High School I made a critical mistake when programming the training of the incoming class. I progressed them much too quickly to loaded movements. I was caught up in the thought of getting these kids (mostly football players) ready for the upcoming season and I was not seeing the big picture. Doing this compromised the quality of the movements and increased the likelihood of injury in training. Thankfully no injuries occurred, but it made enough impact for me to rethink the way I approach training the young high school athlete. With the help of my assistants, Jason Maclean and Corey Barboza, we have developed our own version of the Block Zero program. We have 3 main goals for the program. All 3 of these things sound so simple. One would think that young people, specifically athletes, would be able to demonstrate these qualities with efficiency. This is not the case however. In today’s technology laden world, simple “free play” is rare. In the early developmental years when kids should be learning simple things like how to move and control their bodies while playing outside they are instead glued in front of a tablet or Xbox. This is why we, at Trinity, take the time to slow things down and establish a solid foundation for things to come. You have to remember, in high school we have them for 4 years. That is a long time to spend developing an athlete and with puberty doing a lot of the work for us, it will not take long to see positive strength results. You have to be willing to take the time to get them right, then get them strong. The first thing we teach to our incoming kids is how to breathe properly. 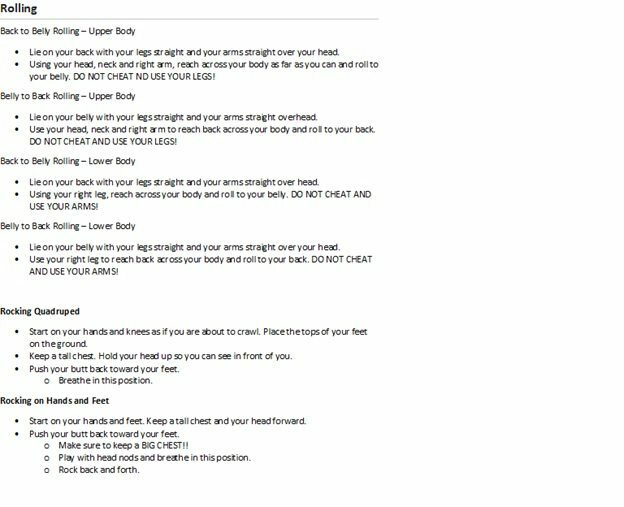 We use 3 different breathing techniques when working with our young athletes in large groups, in the following order. * Crocodile Breathing – Lying prone with hands on top of each other and elbows at 45 degrees we cue our kids to take a deep breath in through the nose and to feel their belly press against the floor. We hold the breath for a count and cue a hard exhale from the mouth to complete the rep.
* Supine Breathing w/knees bent – The next progression we flip to a supine position and have our kids bring their heels close to their butts. This helps achieve the posterior tilt in the hips and get our lower back flat on the floor. We are again cueing the same breathing mechanics as before, but with more of an emphasis on the hard exhale and pulling the ribs down. * Roundback Breathing – I picked this one up from Mike Robertson at EADS ’15 and loved it from the minute I started using it. We have our athletes get in to an all fours position and slightly rock forward. They apply force to the ground to help spread their scapulas apart and tuck their hips under in to posterior tilt. We cue the same breathing mechanics of filling the belly and pushing air in to the upper back. We generally perform 2-3 sets of 5 breathes before we move on to our dynamic warm-up. With our breathing drills, and all drills and coaching for that matter, we keep our cueing as simple as possible. We try to speak in a language that our kids can quickly understand. From here we move on to rolling. Much of what we do in regard to rolling can be found in “Original Strength” by Tim Anderson. This book has been phenomenal in helping us teach basic movement patterns to our athletes. Using these techniques our athletes are able to properly brace their core and move fluidly through their hips. We use segmental rolling, both upper body and lower body during the first few weeks (4-6 sessions) and then we move on to hard rolls. Once our kids have a decent grasp on the breathing we really see our rolling movements clean up. Coupled with the rolling movements we also use rocking progressions from both the quadruped position and on hands and feet. We introduce crawling movements in the 3rd or 4th week of working with the incoming kids. Crawling can be difficult to do correctly and it can become frustrating when struggled with. Making sure they understand the basics of controlling their bodies and how to move is very important in terms of helping them have success in their crawls. * Army crawls are where we start. Imagine soldiers crawling under barbed wire and you’ll know what I am talking about. * Leopard Crawls (Original Strength). These crawls are performed with knees inside the elbows, driving one knee into chest while fully extended the opposite limb. Goal is to to keep shoulder and hip height even. We do our crawls in all different directions, forwards, backwards and sideways. We start slow to ensure movement quality, but as proficiency is shown we will have our kids try and push the pace on them while still doing them properly. At this point, my staff and I are not concerned with developing a competitive environment as they are still new to everything we are doing and we want to see things done with as much accuracy as possible. It is our belief that if we shift the focus to seeing who can complete each movement the fastest then we compromise the integrity of what we are trying to accomplish. As a staff, we will focus on developing the competitive atmosphere when they come back to us in the late summer/early fall. The final piece of our program that we introduce starting the first day is tumbling. We are lucky enough to have access to our wrestling room so we have a perfect spot to practice all of these movements. Shoulder rolls, both left and right, are the main portion of this. What we are looking for with the rolls is mainly body control. We want to see our kids not only execute the roll, but to also be able to come out of the roll in a position that they can move out of, the athletic position. When they have exhibited control we will add another element to the roll. We may have them going directly in to another roll on the opposite shoulder or into a short sprint afterwards. There are many variations you can add in to keep it fun for the kids. The kids take to this very quickly because, quite simply, it is pretty fun. What kid doesn’t like doing barrel rolls? Aside from some group conditioning, that is what the first few weeks of our program consists of for our incoming freshmen. In Part 2 of this article I will discuss the 2nd part of our Block Zero program where we begin to take our athletes through our fundamental movement progressions.